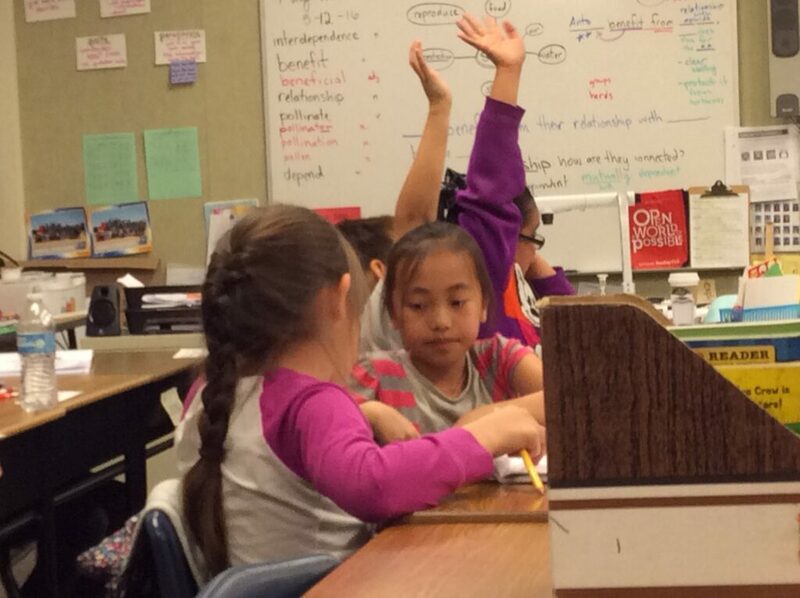 Students at Rowell Elementary in Fresno discuss a science lesson. In a partial victory for California, the U.S. Department of Education has granted the state a retroactive waiver from administering outdated science tests, instead allowing it to give students pilot tests based on new science standards. But the department granted the waiver only for the just completed school year. It made it clear that the waiver doesn’t apply to the current school year, and that if California did the same thing it did last year it could run afoul of the law and risk penalties that could include losing federal funds. For over a year, the state has been locked in a conflict with the U.S. Department of Education over the way California is developing and implementing assessments to measure progress on the Next Generation Science Standards. These are standards the state adopted in 2013, replacing the old standards in place since 1998. The issue is far more than just a technical one over state compliance with federal regulations. Rather, it is one of deep concern to many science teachers in the process of applying the new standards to their classroom instruction, and some may feel anxious about not knowing for sure what standards or assessments their students will be tested on. Just two days before President Barack Obama left office, federal education officials rejected a waiver request similar to the one just approved by the Trump administration. At the time, they said that California’s plan to administer a pilot version of assessments based on the new standards, called the California Science Test, or CAST, along with new assessments for students with cognitive disabilities, did not satisfy the terms of the federal No Child Left Behind law or the Individuals with Disabilities Education Act covering special education students. California subsequently submitted a revised waiver request to the Trump administration just to cover the 2016-17 school year. Jason Botel, the acting assistant secretary for elementary and secondary education, granted the request, but with a warning. Keric Ashley, California’s deputy superintendent of public instruction, who oversees data and assessment for the state, welcomed the federal waiver, albeit a retroactive one. “We are pleased to have received this waiver and we look forward to working with the U.S. Department of Education moving forward to ensure that our science assessment is aligned with the Next Generation Science Standards,” he said. He told EdSource that during the coming months the state will submit a plan to satisfy federal concerns, rather than a formal waiver request. That could include some way of reporting to parents student results on the assessments, even though these assessments may not be in their final form. Regardless of what happens, California is not planning to administer the old California Science Test this spring. Instead, it will administer a longer field test of the new version, with full implementation planned for the 2018-19 school year. The California Science Teachers Association said it fully supports California’s approach to phasing in the new tests, and leaving the old tests behind. “We continue to support the science assessment implementation plan that was thoughtfully outlined by the California Department of Education last year,” said Jill Grace, the association’s president. “Taking the time to allow students and teachers to experience both a pilot and field test without the pressure of accountability is essential and supportive of the measured approach to implementation of the Next Generation Science Standards that we support,” Grace said. Under the old No Child Left Behind law and the Every Student Succeeds Act which replaces it, states are required to administer science and other subject matter tests to all students in 5th and 8th grade, and either 10th, 11th or 12thgrade at each high school, and publish the results of those tests. But the state stopped administering those tests in English, math and science, while it phased in new tests aligned with the Common Core standards in English and math, and later the new tests still under development that are aligned with the Next Generation Science Standards. The pilot test that California administered last spring was a computer-based exam of 15 to 22 questions that took 1 to 2 hours to complete. A longer field test is planned for this spring. The Next Generation Science Standards, which has been adopted by 18 other states, focuses on critical thinking and hands-on science projects, along with a far more interdisciplinary approach to science instruction than the earlier standards. Botel, the official who granted California’s science assessment waiver, has himself been the center of controversy because of his leadership role in a strict review of a number of plans states had to submit to the federal government under the terms of the Every Student Succeeds Act. In several instances, he sent the plans back to the states, saying they needed more detail and rigor. In one case — Delaware — he told the state it had not been “ambitious enough” in its plan.